Many people come here expecting to find a beach laden with shells. However, the beach takes its name from Henry Shelly, one of the crew of Sir George Somers’ wrecked ship, the Sea Venture. 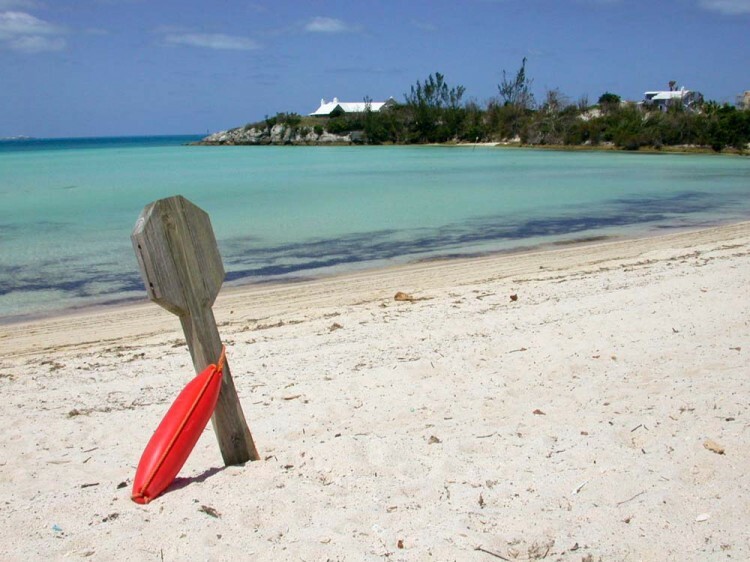 Shelly Bay isn’t the prettiest of the beaches in Bermuda, but it is one of the best for children and families. Located within a bay, the ocean here is generally calmer than at most other beaches. The water is also shallow. Kids can wander out for hundreds of yards without getting out of their depth. Trees line the beach and provide cover from the hot sun. The adjacent park has a playground with climbing frames, swings and slides. Local soccer and cricket teams also play here at weekends. The Shelley Bay Nature Reserve is also here and features a red mangrove forest, a saltwater pond, and endemic Bermuda cedar trees. It’s fairly small but is a good spot for bird watching or a relaxing walk. Shelly Bay is situated in Hamilton Parish (nowhere near Hamilton incidentally). To get their by public transport catch bus number 10 or bus number 11 from Hamilton or St George. There’s a parking lot between the beach and park with spaces for both scooters and cars. There’s a supermarket ½ mile north of the beach where you can stock up on provisions for a picnic. There’s also an ATM here. 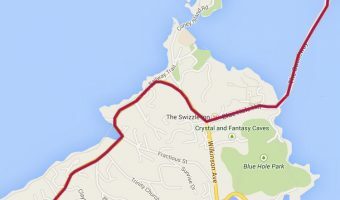 The Hamilton Parish section of the Bermuda Railway Trail starts near Flatts and runs north to Coney Island, passing Shelly Bay on the way. With dramatic ocean views it’s one of the most scenic sections of the trail. Other attractions in the area include BAMZ, Crystal and Fantasy Caves, and Blue Hole Park. 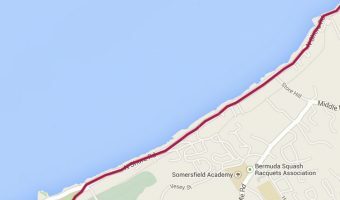 Map showing location of Shelly Bay Beach. The water here is very calm and the beach has a gentle slope into the water. I loved the shade provided by the trees. There were no crowds, but also no real facilities to speak of. This is the beach to go to if you don’t like crowds. Many others we visited were quite busy. When we visited here there were just a handful of people on it. There were no facilities or rentals but there was a children’s park. The bus stop was close by and getting there was no problem. This isn’t the prettiest of the beaches on the island, but it’s by no means ugly. It’s one of the best choices if you’ve got children. The water is very shallow and there is also a decent playground and a sports field where you can play soccer. Don’t forget to bring a ball. There’s also a basketball court, but it was busy when we were there. No real facilities as such. If you are looking for a beach with concessions you need to go to Horseshoe. One of my favorite beaches in Bermuda and the world. The water was an amazing color and so calm. Even without kids, you could float and it literally seemed like you would step back in time. A wonderful beach. Shelly Bay is nice but would be much better without the seaweed. Plus it is nice for children to play and is also relaxing for the parents. Shelly bay beach has a wonderful play ground and field where you can run and play. The beach house has good food and a porch you can sit and enjoy the view while you have lunch. The beach is shallow going out to about 200 feet with white sand. Enjoy. We stumbled upon Shelly Bay Beach on a moped ride. It was fantastic and we don’t even have children! The waters were nice and calm and WARM. It appeared to be mostly locals at the beach. We’ll definitely go back! We just returned from a seven day cruise on the Norwegian Majesty. Shelly Bay is one of the best beaches for small children. Our three year old enjoyed both, the shallow water and the playground. Our 9 year old loved being able to walk and swim out at least 50-60 yards without going over his head. People miss out on this one! I prefer Horseshoe bay for the kids because of the nice small reef. Shelly Bay has a great, brand new playground, and the water there, although quite salty, is nice and warm. Shelly Bay is a very quiet beach and it’s rare to find any tourists on it. I suppose it’s because there’s not many hotels in this area of Bermuda. Comprehensive guide to Hamilton Parish. Includes places to stay, restaurants and pubs, things to do, tourist attractions, supermarkets, bus routes, and more.